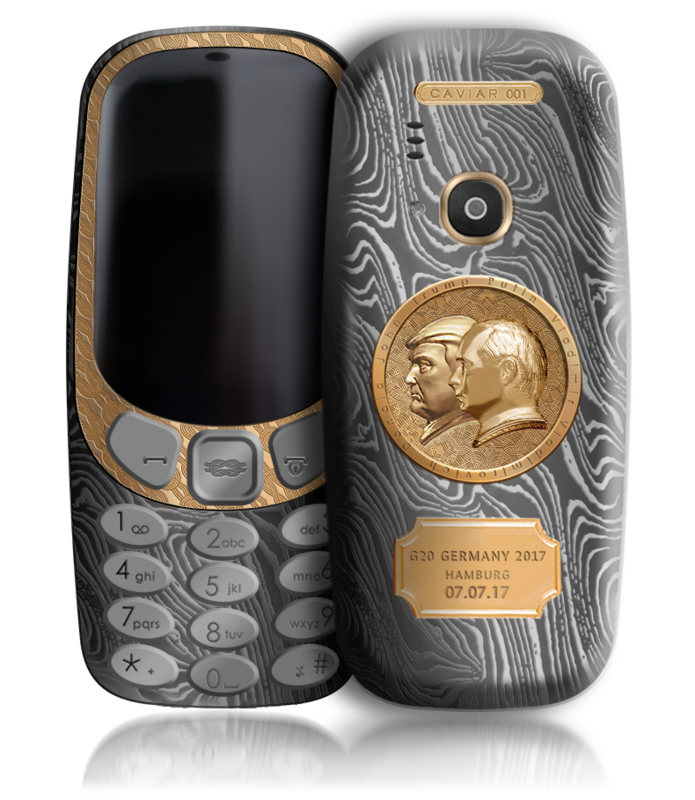 It’s time for the big G-20 summit in Hamburg, and Russian phone customizers Caviar are commemorating the occasion with a very special Nokia 3310 (the new one). Encased in the best metals, titanium and gold, the back features a touching double profile of Trump and Putin. Only 149,000 rubles, or about $2,500. “Wait,” you say. “Wasn’t the new 3310 a clumsy attempt to capitalize on nostalgia for the durable old 3310 we all bought and loved back in the salad days of candy bar phones?” Yes, it was. And no, Caviar didn’t think to update the radio so it can achieve more than EDGE speeds. The symbology, or symbolism if you prefer, of this luxurious upgrade is elucidated on the Caviar website. That both presidents face one direction suggests they are in accord. But why are they facing left? It is not explained. The use of hardened titanium emphasizes that strength, principles and firmness, not to say stubbornness, are required in order to protect justice and country. A Damascus steel pattern is used because it looks cool. It is suggested to give this unique item to someone who is “not indifferent to contemporary history and politics,” which is sound advice. A mysterious epigram at the end of the description is either a nugget of wisdom or a particularly Russian threat: to paraphrase it, “if you don’t engage with politics, politics will engage with you.” A happy thought! There’s also an iPhone 7 one, but it’s not as amazing. RT points out that if you really like this pairing, you can get dental crowns with them etched into them as well.